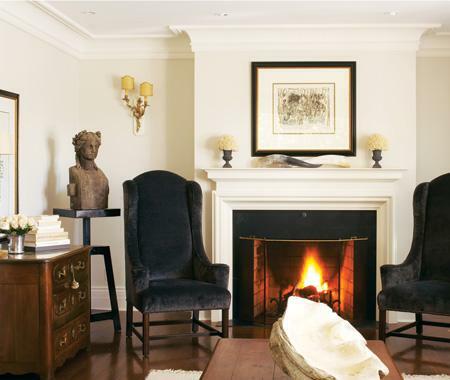 There is just something about a roaring fire that screams cozy, warm and comfortable. With the snow/rain storm that is expected to hit Boston tonight, this is where I would like to be for the next few days till it blows over. love this image. Bad weather = wanting to hole up inside with a great cashmere throw in front of the fire! It look so cozy, like a pretty B&B in Vermont! Not looking forward to driving to work tomorrow in the mess that's predicted. I love looking at and playing in snow, but not driving in it! Sending cozy thoughts your way. It's drizzly and gray down here in TX, but not all that cold. Still, a warm hearth is enticing - as is a perfect mug of homemade cider! It's already in Nashville! I would LOVE to have a fireplace/fire! No amount of heat replaces a good ole fire! I love cold weather that makes you want to be in front of a fireplace with a good book and maybe even a hallmark movie. Cheesy, but so good! FYI-- I posted a link to your site today from the beautiful chairs you recovered. Love these chairs, too. oh my that is pretty! House and Home is totally in my head lately. we had a little dusting of snow this weekend and it was so lovely. I'm sure it's nothing by New England standards, but I'll take what I can get! hope you stay cozy! So cozy! Now that's actually cold in Boston I'm dreaming of a warm fire... too bad mine is just for decoration! Yes, curled up by the fire watching a great movie on TV is the best when it's cold out!! Lots of tea and hot chocolate, and a good blanket. I really wish my fireplace worked! This looks sooooo cozy! I love so many things about this room, especially those chairs- very cozy! I hope you're keeping warm! It even snowed in TX last week! Those Chairs! I love that 'faux' wing!!! OMG. I am trying to have our dining room chairs made kinda like that....a blogworthy project, next year!! Gorgeous pic! Ahhh- I want a fireplace! that is a handsome room. those chairs and that little wooden chest of drawers are hollerin' to me.